This Elgi Ultra Perfect+ stone wet grinder for home is made in India and is ideal for small family. It is engineered to last for years. Has a quiet and efficient motor, sleek space saving style & rugged plastic and metal design. Stone wet grinders are used to grind many things. The tough stones, and the powerful motor help immensely. The Atta kneader is also a great tool that is included with this product. The atta kneader helps to knead dough to make soft chewy chapatis and rotis. Power Supply AC Single phase, 110V, 60Hz - ready for use in USA and Canada. Attractive, compact sleek unit complements any kitchen. Detachable drum is easy to clean and maintain. Conical grinding stones for efficient grinding and smoother batter. 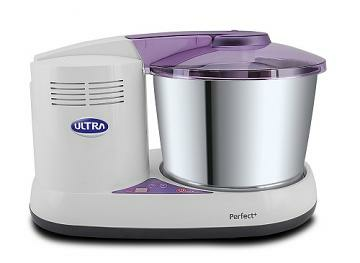 This Elgi Ultra Perfect Plus wet stone grinder is a product of ELGI Group, India. Elgi Ultra Industries Limited, an ISO 9000:2001 certified company started its operations in the year 1983. Warranty: Comes with 1 year warranty from manufacturing defects. This item in Indian Mixer Grinder category was first added to our catalog on 01-30-2017. Buy Stone Table Top Wet Grinder (Elgi Ultra Perfect +) 2 ltrs, 110 Volts, sold & shipped by Gandhi Appliances where you can shop online for Indian Mixie, Wet Grinder, Pressure Cooker, Mixer Blender & Sports Store. This Mixer Grinder collection has been tagged as small kitchen appliance, stone tilting best price wet grinder usa, idli rava maker, south indian restaurant supply, indian mixie sale in usa, indian mixer.